Take a piece of construction paper and cut it lengthwise. Fold both pieces in thirds. They now make two tents with open tops. 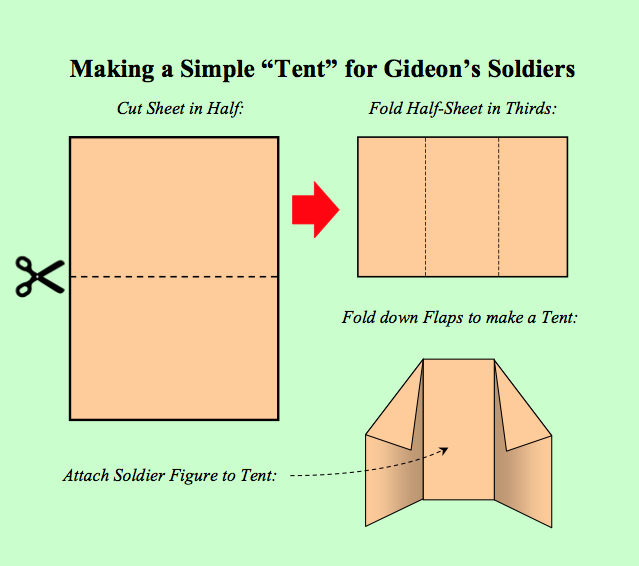 Lay them flat on a table and glue the soldier costume onto the side of the tent. 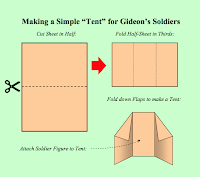 Be sure to glue the soldier costume and draw him so that the feet will be on the ground when the tent is put upright. Draw in the soldier's face and color the costume. Tape the two ends of the tent together so that it stands up. Set up all the tents/soldiers in the middle of the classroom to use during the drama reading. Each child will need a kazoo or some other instrument to use as a horn and a flashlight. Read through the drama. Near the end when Gideon tells the men to surround the Midianites turn off the lights (making sure everyone can still read the drama). 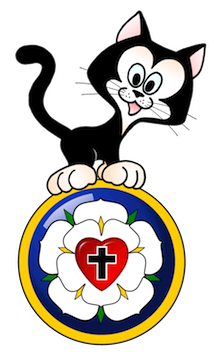 When the army shouts, "For the Lord and for Gideon!" the children should blow their kazoos and point their flashlights all around the Midianite camp set up earlier.